Maximizer TPC, highlighting the press control’s latest enhancements and features. The Maximizer TPC includes a 15-in. 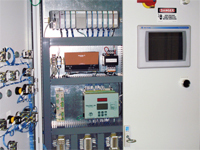 PC operator screen, the Toledo Press Pilot 150 clutch/brake controller and a PLC for integrating standard automation along with user-defined inputs and outputs. The color, touch operator screen provides information right at the machine, allows users to save and view drawings, pictures and part dimensions with the job recipe. Unlike other proprietary black-box systems, the Maximzer TPC allows for complete expandability and customization.